Project: Mid-Bay Bridge Connector Phases II and III | Tierra, Inc. The Mid-Bay Bridge is a 3.6 mile, two (2)-lane toll bridge spanning the Choctawhatchee Bay, in Okaloosa County. The existing bridge begins in Niceville, Florida and ends in Destin, Florida. The Mid-Bay Bridge Connector Phase II and III consist of a new limited access toll facility connecting the existing Mid-Bay Bridge to SR 85 bypassing the city of Niceville. The project alignment for Phases II and III are located primarily on property owned by Eglin Air Force Base. Land use along the alignment generally consists of rural undeveloped land and natural forests. In addition, naturally occurring streams, creeks, and swamps are located at several locations. The proposed improvements consist of the design and construction of a new 2-lane rural road (4-lane ultimate), a new tolling facility, three (3) interchange/bridge structures at Range Road, SR 285 and SR 85 and five (5) bridge structures located at Rocky Bayou, East Turkey Creek, Swift Creek, Fox Head Branch and Mill Creek. Tierra performed extensive subsurface explorations including over 15,000 feet of SPT borings and over 9,000 feet of auger borings along the project alignment. A large muck/peat pocket was identified at the Rocky Bayou Bridge crossing. 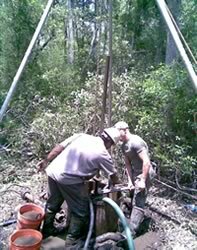 SPT borings using manual “tri-pod” methods were utilized to develop deep foundation recommendations and construction considerations for the proposed Rocky Bayou Bridge Structure to account for the muck/peat soils of up to 30 feet in depth. Laboratory testing was performed on selected soil samples to develop the project soil legend using both the AASHTO and USCS classification systems. Geotechnical engineering recommendations for the proposed roadway, bridge structures, retaining walls, sign structures, and pond design were provided informal engineering reports in accordance with FDOT guidelines. In addition, engineering recommendations were developed for slope stability of the proposed roadway in areas where “steepheads” were identified during our explorations.